The following continues a series of contributions from Dr. Stephen James, who works with the Architecture and Planning collections here at the University of Houston Special Collections. Dr. James holds a Ph.D. in Architectural History from the University of Virginia and for many years was a lecturer at the University of Houston College of Architecture. A part of Houston’s history disappeared last weekend. In the early morning hours of Sunday, September 22nd, demolition crews imploded the Macy’s building on Main Street in the downtown area. The building—until 2006 the flagship of the Foley’s department store chain—had not been an important part of Houston commerce and culture for many years. But its passing is another marker that requires us to look back, if only for a moment, at a time when Houston was a very different place than it is now. 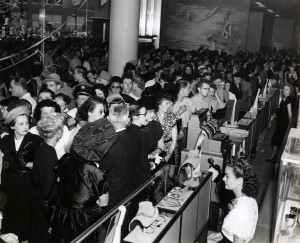 The building’s grand opening in 1947 was a major event. With a population under 500,000, Houston was a much smaller city, and most people lived within a few miles of the downtown business district. There were no suburban shopping malls, and downtown was the focus for most shopping and entertainment. 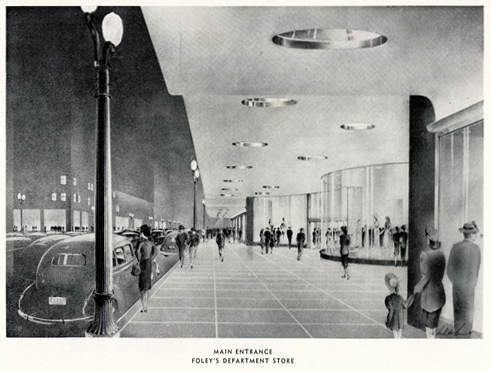 Citizens marveled at the new Foley’s building and welcomed the convenience of a large department store. Unlike smaller specialty retailers, Foley’s offered appliances, clothing, furniture, and many other items, all in one place. And what a place it was! With six floors of merchandise (later expanded to ten) covering an entire city block, it was enormous—a Texas-sized store for the state’s largest city. 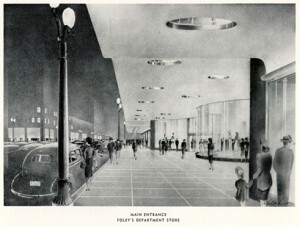 In keeping with the company’s ambitions to be the state’s premier retailer, Foley’s hired Kenneth Franzheim, one of the city’s leading architects, to design the new building. 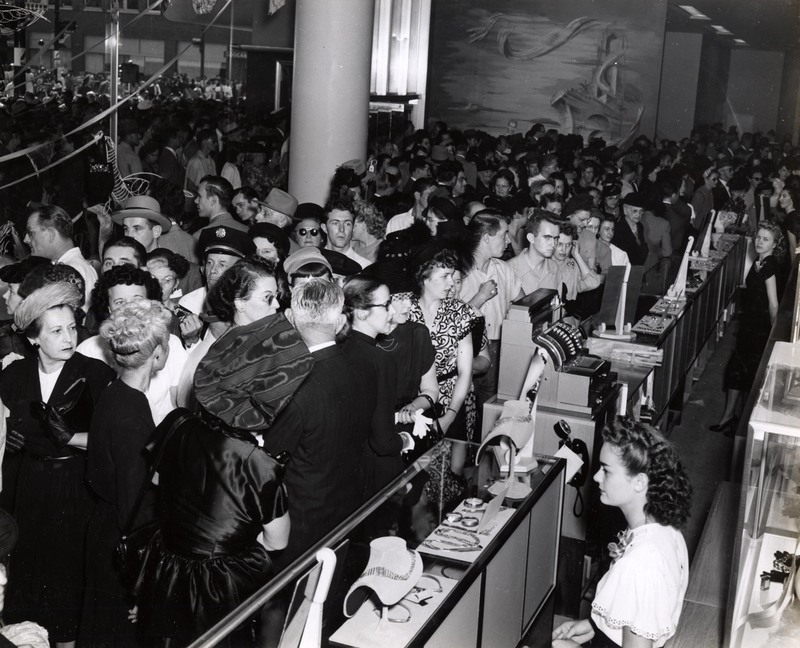 Air conditioning cooled the store’s shoppers while the fastest escalators sped them between floors. In hindsight, Foley’s downtown store opened near the end of the era that spawned it. Less than a decade later, Houston began its explosive march to the suburbs. By the mid-1950s the opening of the city’s first automobile expressway, the Gulf Freeway, paved the way for Gulfgate, its first large suburban shopping mall. Others soon followed. 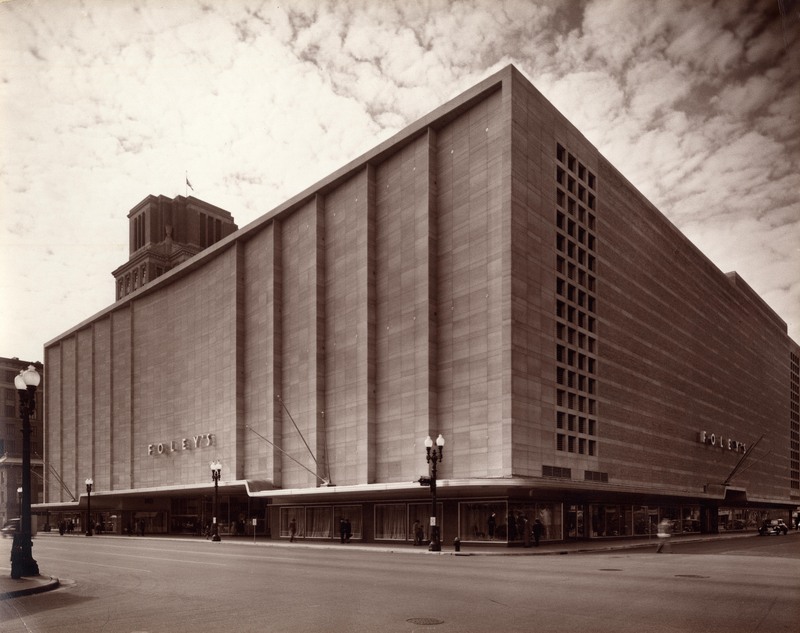 And while the downtown store remained the flagship of a sprawling chain that catered to suburban shoppers, business dwindled downtown, as office workers and inner-city residents claimed the aisles. Sadly, when the explosive charges brought down Franzheim’s massive store, the building had long outlived the business and social models that created it. The compact urban area focused on downtown was a quaint relic of an earlier day. It was time to move on in a city unable to embrace the future without first erasing its past. The University of Houston preserves the history of the Foley’s building and the company that created it in the Foley’s Department Store Records, housed in Anderson Library’s Special Collections Department. 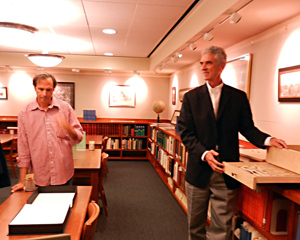 The university’s William R. Jenkins Architecture and Art Library holds the Kenneth Franzheim Collection, which contains many of the architect’s drawings and papers. See also an earlier entry by Gregory Yerke in the Special Collections blog, “Foley’s and Houston: A Century of History”. For further information, researchers should consult Foley’s by Lasker M. Meyer (Charleston, S.C.: Arcadia Publishing, 2011). A juried show by the Women in the Literary and Visual Arts (WiVLA) will hold its opening reception at 6pm this evening at the Museum of Printing History. “Freeing The Word In Small Spaces” will showcase the work of artists challenged to reflect on and consider the possibilities of the evolution of the written word from hand-bound rarities, through the new accessibility afforded by the printing press, and on into a new paradigm that sees the printed word melding with the electronic device. The Women in the Literary and Visual Arts was founded in the early 1990s in an ambitious attempt to create a network for writers and visual artists. 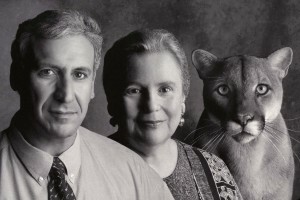 The brainchild of a writer, an artist, and an art consultant, the early founders were members of a professional buisnesswomen’s organization and the benefits of a similar network for those in the creative community became readily apparent. The idea quickly gained traction and continues to provide a forum for women in Houston to nurture the creative efforts of others, collaborate artistically, and promote the work of members. Tonight’s opening reception marks another success in that journey. Here at the University of Houston Special Collections, we are proud to make available for study the Women in the Visual and Literary Arts Records. Though relatively young in its history, the WiVLA Records provide a look at their formation, organization, and work supporting artists through the years. Materials in the collection include not only administrative documents and communications, but also information and photographs documenting events and shows through the years. If you have not already, make plans to attend “Freeing The Word In Small Spaces.” While you are at it, why not come see what WiVLA’s history holds as well? 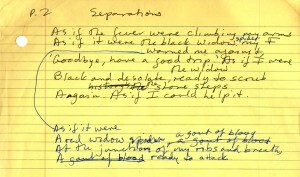 Metaphors were mixed, tales of triumph told, and everyone walked away with their eyes a little wider. It could mean only one thing. 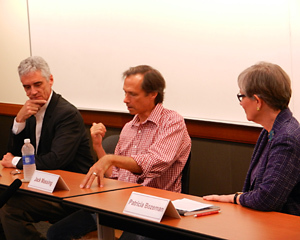 The Art Guys paid a visit to the University of Houston on Wednesday, September 11th, as Special Collections hosted “Archiving the Art Guys: A Conversation with the Art Community.” Moderated by Pat Bozeman, Head of Special Collections, Michael Galbreth and Jack Massing (their lesser-known monikers) tackled a wide range of topics covering their early days at UH and genesis of their unique brand, the challenges and rewards of creative dialogue and collaboration, as well as the role of the artist in contemporary society. Described by the New York Times as “a cross between Dada, David Letterman, John Cage and the Smothers Brothers,” Galbreth and Massing met while attending UH and, in one famous handshake, forged a partnership that continues to challenge the manner in which we view the world and gives voice to a contrarian song in the din and echo of consenting choruses. Students at UH may know them best for the cryptic “Statue of Four Lies” near Cougar Village, but veterans of the art scene in Houston and abroad know The Art Guys for producing decades of irreverent art, redefining the term and concept with each work. Fortunately for present and future researchers, they have also kept a meticulous account of it through the years. The Art Guys recently donated their records to UH and naturally last week’s conversation turned to speculation regarding possible uses of the materials for future research. A consensus seemed to emerge that, aside from the more obvious lines of artistic study and survey of art history in Houston, there are likely answers in these materials to questions not yet posited. Fueling further excitement was the reminder that this is a living collection. The Art Guys after all continue to survive, thrive, and, thankfully, challenge the way we view the world–a view promising to be expanded as the collection itself grows over the years. We thank The Art Guys and all who attended last week. My eyes, for one, were certainly wider walking out. The Art Guys Records are currently being processed, but we will be sure to announce when they are available for study. In the meantime, learn more about The Art Guys by visiting their website and reading up on the ongoing events commemorating their 30 year anniversary. What does it mean to live the Writer’s Life? We often hold to the stereotype of the solitary writer, alone among her books in a cramped apartment above a laundromat or a Greek restaurant, hammering away at the keyboard (or better yet: typewriter) to the strains of the city outside her window, the cacophony of sirens and taxicabs and nightclub jazz and the whistle and scream of anguished souls on the streets below. Or the even more hermit-like author, tucked away in a mountain cabin, sitting in a rocking chair he carved himself while ruminating on the beautiful mysteries of Mother Nature and the folly of humankind. But there is another way, and Cynthia Macdonald, co-founder of the UH Creative Writing Program, has lived it. The Writer’s Life can be one that is fully engaged with the world around her. The writer can laugh and cry and struggle and celebrate with an unrelenting vigor. The writer can draw people into her orbit; can follow her curiosity down myriad paths to become an eclectic expert; can live firmly on the ground in the real world and turn its drudgeries and heartbreaks and ecstasies into Art. The finding aid for the Cynthia Macdonald Papers is now available online, and the collection is a treasure trove for researchers, writing students, fans of Macdonald’s poetry, and anyone interested in seeing how a writer makes a go of it in this world. Special Collections houses more than 45 boxes of Cynthia Macdonald’s work and personal materials. 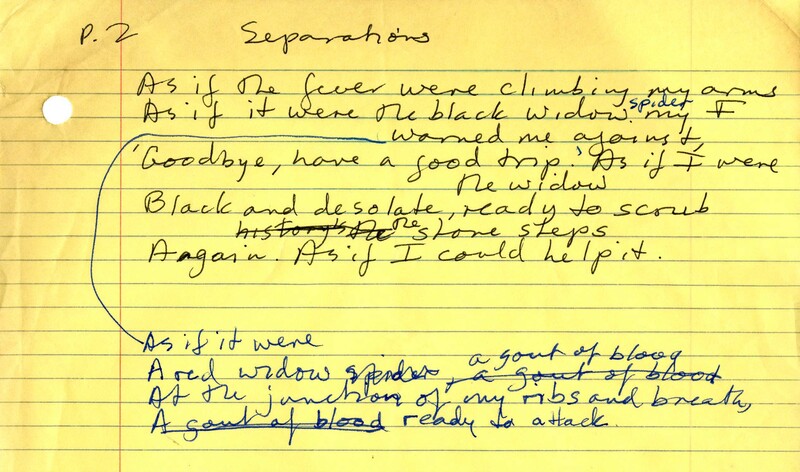 The collection includes multiple drafts of her poems, both published and unpublished, both typed and handwritten, from scrawls on paper napkins and backs of envelopes to fully polished manuscripts. In addition to Macdonald’s writings, the collection also highlights the business and publicity surrounding a modern writer: contracts and royalty statements; writing proposals, grants, and awards; news clippings, book reviews, and poetry readings. The abundance of correspondence is especially rich, featuring letters to and from Macdonald’s writing friends, teaching colleagues, and family members. Among the many noteworthy contributors are famous poets and writers such as Louise Erdrich, James Michener, Adrienne Rich, and Anne Sexton, as well as artists in other fields such as painter Helen Frankenthaler, photographer Gay Block, and singer Judy Collins. The collection also provides a window into Macdonald’s long career as co-founder and teacher at UH’s acclaimed Creative Writing Program; her early, budding career as an opera singer; and her later, successful career as a professional psychoanalyst. The diligent researcher can also piece together other aspects of Macdonald’s life from a vast array of personal and family mementos and photographs, collected over almost the entire course of her life, from early childhood onward. 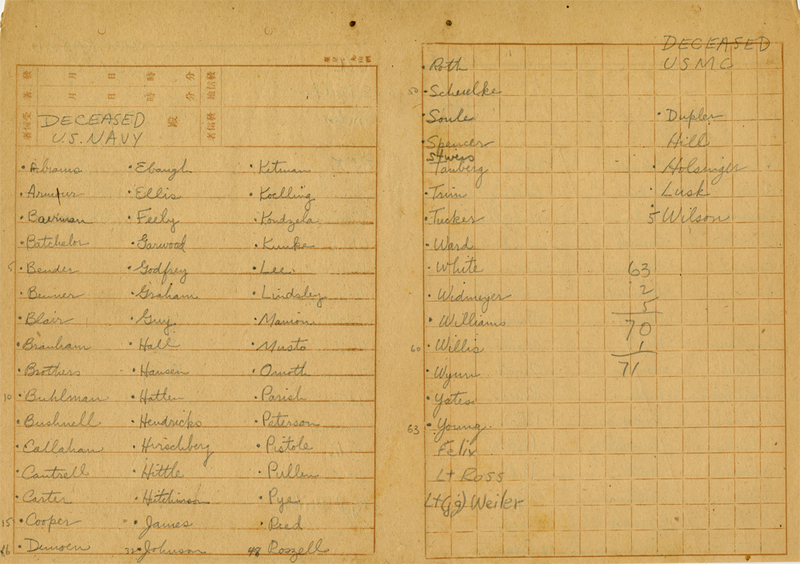 For more information about what is contained in the collection, be sure to take a look at the detailed finding aid. The original materials can be viewed in the Special Collections Reading Room. So, what does it mean to live the Writer’s Life – or any life, for that matter? One way is to hunker down, hole up, and protect one’s writing and one’s heart in the safety of one’s own company, alone, but safe, but alone. Another way, though, as Cynthia Macdonald has demonstrated, is to reach out for all of life, to embrace life fiercely and expressly, to share bravely our thoughts and opinions and hearts with others, to write and live and write again and live some more, to dare to engage every aspect of the world around us, opening ourselves to the possibility of pain, yes, but to that of love as well. We have recently published an update to our Cruiser Houston Collection finding aid to include a series dedicated to the papers and artifacts of Lieutenant Preston R. Clark. Materials added to the collection include photographs, correspondence from World War II prisoner of war camps, and artifacts from the years spent in the camps. Lieutenant Clark served on the USS Houston when it was sunk following a bravely defiant stand during the Battle of the Java Sea. Presumed lost in the aftermath, Lt. Clark and others survived hours of swimming to dry land only to be captured by the Japanese and interned in P.O.W. camps. Clark remained in captivity for nearly four years where he and others worked on the Thailand-Burma or “Death Railway” (a construction project immortalized in Pierre Boulle’s The Bridge over the River Kwai and the film of the same name). 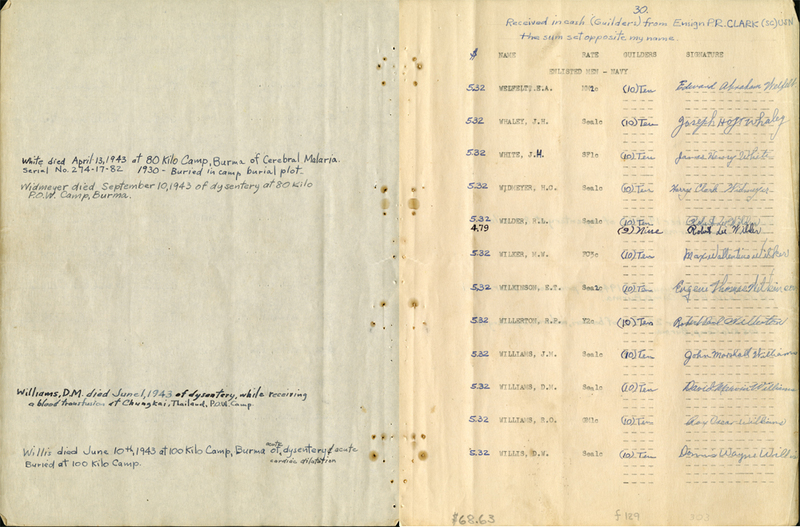 While in captivity, Clark continued to fulfill his duties as Lieutenant, even maintaining a log of payments to the men under his command while facing extraordinary loss and circumstances beyond hyperbole. Anecdotally, survivors of the USS Houston and their loved ones speak highly of his leadership and service during those years of imprisonment. 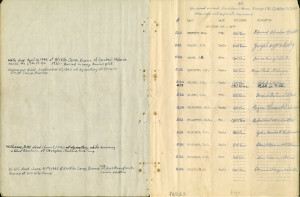 His meticulous records and attention to his duty no doubt helped to bring about balance to pay logs and some degree of normalcy to his men, but also brought a peace to the families and loved ones of those that were lost while held captive, by way of recording details regarding circumstances of death and final resting places for those unable to make it home. Clark and many of his men were liberated as the war in the Pacific reached its end. 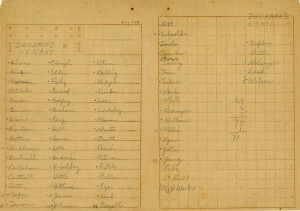 The documents that came home with Clark, along with the wealth of additional primary sources included in these materials, are sure to provide researchers with fresh insight into the sacrifices offered up by so many. We encourage you to visit us here in Special Collections, tour the USS Houston exhibit located on the second floor of the M.D. Anderson Library, and survey these updated materials for yourself.